Send a touching gesture of peace and comfort to the home or service with our beautiful arrangement of roses, lilies, alstroemeria, daisy poms and mini carnations. Elegantly arranged in a handled willow basket, it’s a lovely tribute to a loved one who has passed away. • Graceful yellow and white arrangement of roses, lilies, alstroemeria, daisy poms, mini carnations and solidago, accented with variegated pittosporum and myrtle. 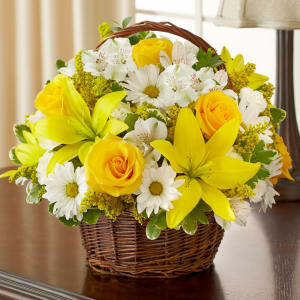 • Hand-arranged in a willow handled basket; measures 8"H.
• Appropriate to send to the home of friends and family members or to the memorial service. Flowers will be received by a Cook Family Funeral Home's staff. It was so nice to be able to shop for flowers and delivery. We live so far away and could not possibly be there so at least we were represented to the sweet family!!! The basket of flowers was nicely displayed at the Memorial Service. Much smaller than I expected. Pretty, but small. All of our flowers are designed and delivered by hand from a local florist in in Bainbridge Island.